One of my friends who is expecting a baby very soon asked me if I knew anything about cameras or baby monitors that could work with her iPhone. I told her I was not that familiar with them but would try and get a few of the popular products to review. Recently BabyPing sent us their Wi-Fi baby monitor for us to do a review on. In this review I will go over the positives and negatives of the BabyPing Wi-Fi baby monitor and explain why it is one of the best baby monitors on the market today. First off, having a newborn baby is a major change in your life and you want to make sure everything is perfect so that you can take the absolute best care of your child. Having a baby monitor tied to your cell phone makes your life that much easier. Since almost everyone has a cellphone with them or within a few feet at all times of the day, integrating the baby monitor into the phone makes perfect sense. Nobody likes to carry multiple devices, this is why we have seen the smartphone evolve into one of the most important devices in our lives. It has replaced PDAs, calculators, portable gaming systems, and much much more, combining them all into one device. Just as Apple says, “There is an app for that,” there really is an app to monitor your baby at all times and from anywhere in the word. Since I do not currently have a baby at home that I needed to monitor for this review, I decided to setup the camera to watch our dogs who are basically our little babies. I opened the package which was very well designed and everything was very well organized. Inside the box you will receive: the BabyPing camera, a power adapter with US/UK/EU adapters, a monitor stand, 1m network cable, cable clips, mounting screws & feet, as well as easy to follow instructions. If for some reason you are having a hard time with the instructions, you can always jump onto the BabyPing website and watch their tutorial videos. I am guessing most people can figure it out because setup was super easy. All you have to do is download the BabyPing application from the App Store, plug the Ethernet cable into your router, plug the power supply into the wall and camera, and then follow the onscreen instructions. At first I was expecting the app to find the camera via Wi-Fi, but soon learned that you had to plug the Ethernet cable into your router and then it would save the Wi-Fi settings to the camera. If I would of read the instructions first I would of caught this. Overall setup took only a few minutes and the video feed was live. Inside the app you have a few different options including a SmartFilter and Night vision. The SmartFilter, when set to on, allows you to only hear you baby crying and will filter out other loud sounds. If you set the SmartFilter to off, you will hear everything. With this feature, you can now sleep comfortably since the device will just alert when your baby has started crying. Also within the app settings is the ability to set Night vision to Automatic, always on, or always off. Having control over the Night vision is a great feature as you may have a darker room but do not want the camera to automatically switch over to Night vision. Speaking of Night vision, this camera provides an amazing image with Night vision off as well as on. It can be completely dark in the room and it will look as though a light is still on in the room. I do want to mention that the BabyPing app that you download from the App Store will only work on your Wi-Fi network. If you want to view the camera from anywhere in the world or share the video feed with Grandma and Grandpa, you will have to download the app BabyPing+. This will allow you to set up a secure password and you can limit the access to certain people keeping your camera secure. Currently the applications work on all iOS devices that I have tested, but they have not been optimized for the iPhone 5. The BabyPing+ application works just fine, but seems to be a bit buggy. I am sure the developers will have an updated copy out soon, so this should not deter you from purchasing this camera. 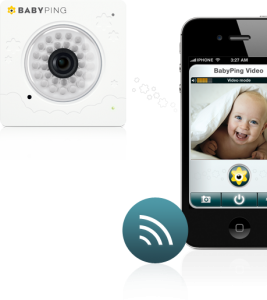 One of the best features of the BabyPing application is that you can monitor your baby and still use your iPhone, iPad, or iPod Touch at the same time. You can exit out of the app and it will continue to run in the background. If there are any errors with your connection or camera, you will get a push notification so you can immediately check to see what is wrong. The only issues I had with the BabyPing Wi-Fi Baby Monitor is that you must have reliable internet access. If you have a weak wireless signal you will want to run a network cable directly from the camera to your modem/router. When using the application to watch video, you will want to be aware that there will be a slight delay due to network speed. It is a very slight delay, but something you should be aware of. Overall the BabyPing Wi-Fi Baby monitor is an excellent choice for those who want to stay connected to their baby and not have to worry about extra devices and for those who want the ability to monitor their baby from an iOS device. It is great for parents who are at work and want to check-in to see how baby is doing with the spouse or babysitter. With the Instant Connect feature, you can keep in touch with your baby anytime you want. 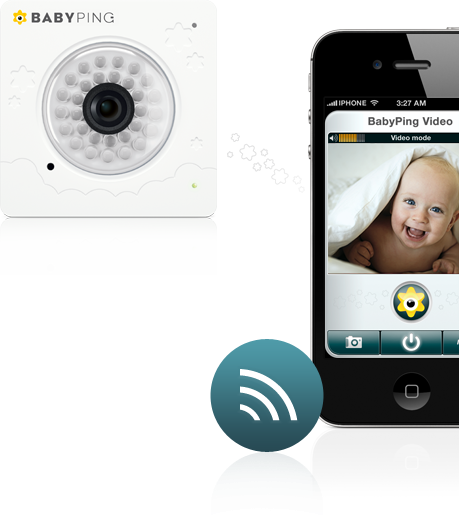 BabyPing – Secure Wi-Fi Baby Monitor for iPhone, iPad and iPod Touch works over 3G, 4G or WiFi is currently priced on the BabyPing website for $199.99, but you can get it onsale right now via Amazon for $179.99. This is a must have app for parents and I would highly recommend it. Once your baby is grown up and out of the crib, you can use the camera to monitor your house or find other uses for a Wi-Fi camera. It is definitely worth the investment and should be on the top of your baby registry list if you are expecting parents. There is not a thing that can ever compare to the joy and happiness that the presence of a baby can bring to one’s life. Parents will always want to see their bundle of joy every now and then just to make sure that he or she is safe. What better way to do that than by using a Wi-Fi baby monitor.